Dairy, or dairy alternatives, are a key part of a healthy diet, and USDA ChooseMyPlate guidelines recommend that both men and women get 3 cups of dairy each day. Milk, as well as plant-based alternative milk sources such as soy milk or almond milk, all count toward your daily intake. Any nonfat, unsweetened milk can work in a weight loss diet, and different types of milk have their distinct weight loss advantages. When you're trying to lose weight, it's essential you create a calorie deficit, a state in which you're burning more calories each day than you're taking in. Your body needs to make up the gap between your calorie intake and the calories you burn, so it starts burning fat as a source of energy, and you lose weight. Each pound of fat corresponds to 3,500 calories, so eating 500 to 1,000 calories fewer than you need each day means a safe weight loss of 1 to 2 pounds weekly. Certain types of milk are better than others for keeping your calories low. 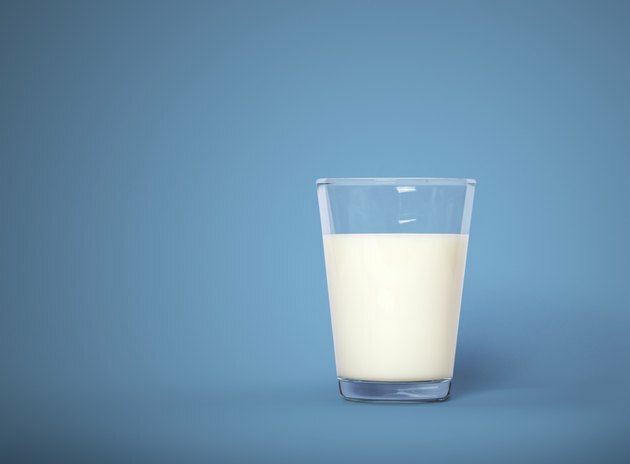 If you're drinking dairy milk, make sure it's nonfat; nonfat milk has just 83 calories per cup, while reduced-fat 2 percent milk has 122 calories and a cup of whole milk has 150 calories, according to LIVESTRONG.com's MyPlate. If you're drinking a dairy alternative, like soy milk or almond milk, choose unsweetened. Sugar-sweetened soy milk has 130 calories per cup, compared to 80 calories for unsweetened soy milk. Sweetened almond milk has 91 calories per cup, compared to 30 calories for unsweetened. Some higher-calorie milk sources, such as dairy and soy milk, may have a weight loss advantage; they're high in protein. A cup of nonfat dairy milk has about 8 grams of protein and soy milk offers 7 to 8 grams of protein. Your body burns calories just digesting protein-rich foods, and protein also boosts satiety, which means you'll feel more satisfied after your meal. Almond milk, while low in calories, has just 1 gram of protein per cup, so you're more likely to feel hungry soon after drinking it. Reach for soy milk or dairy milk as a more filling beverage -- one that may be able to work in place of a snack between meals. Getting enough calcium in your diet might help you reach your weight loss goals, according to a study published in Obesity Research in 2004. The study looked at weight loss in two groups of overweight or obese adults -- one group ate a more standard diet and got 40 to 50 percent of the daily value for calcium from dairy foods, while the other group ate more dairy and took in slightly more than the daily value for calcium each day. At the end of 24 weeks, the higher-calcium group lost significantly more weight and body fat -- including abdominal fat -- than the lower-calcium group. Dairy milk is naturally high in calcium, providing around 30 percent of the daily value per cup. Alternative milk may or may not provide calcium, depending on whether it's fortified or not. Unfortified soy milk might contain as little as 6 percent of the daily value for calcium, for example, while the fortified version has 30 percent. Check the label to make sure you choose an alternative milk with a significant amount of calcium. No matter what type of milk you choose, practice portion control and moderation. Measure out a 1-cup serving, and check the nutrition label if you're buying "single-serving" bottles of milk, as they might contain more than one serving. Count any milk you drink toward your daily calorie intake to maintain your calorie deficit, or you won't lose weight. Don't count on milk as your main source of hydration, either. Water should make up the majority of the fluid you drink -- for both weight loss and overall health. It's naturally free of sugar and calories, which means you can drink it throughout the day without blowing your calorie budget. If you crave more flavor, add some sliced ginger or crushed mint to your water. What Are Some Disadvantages of Milk?